1) BLANK INVITES: 2 (5.25 x 5.25). 2) BUNTING FLAGS: with the words “Happy 4th of July”. Each flag measures 5 inches wide by 9.5 inches long. You can adjust your printer settings to print the flags in any smaller proportional size. 3) BAG TOPPERS: 2 different designs with blank label to add your own text. 4) BOTTLE LABELS: can be used also as NAPKIN RINGS. 5) CUPCAKE WRAPPERS: 2 designs (2 x 2 inch). 6) THANK YOU TAGS: (2 x 2 inch squares). 7) PLACE CARDS: (3.25 x 2.5 inch). The set includes 6 different cards with blank labels to add your own text. 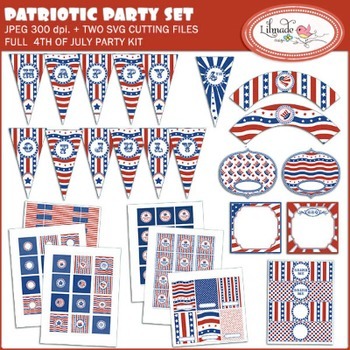 8) DOUBLE SIDED FLAGS to attach to straws of cupcake toppers. 9) CUPCAKE TOPPERS: 2 designs (2 x 2 inches). 10) SVG cutting templates including 1 scallop circle and 1 scallop square, great to enhance your cupcake toppers. Make sure your cutting machine can handle SVG files. All the graphics come in JPEG at 300 dpi. Also included two SVG cutting files. Make sure your cutting machine can handle SVG files. Can be use to decorate your classroom, to decorate events you organize or to create party decorations you will sell already customized for a particular customer and in printed form only. May not be sold in digital form.